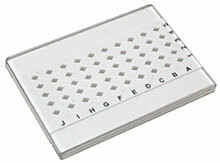 Widely used compact grid box for 50 standard 3.05mm TEM grids with smoothly sliding clear plastic cover is matched to a tough, clean, self-lubricating base. The diamond-shaped grid compartments are designed to minimize awkward wrist or hand movements. The depth of the holes restricts grid movement when transported. The materials selected for the PELCO® Grid Box are static dissipative to avoid static charges on the grids. Dimensions: 77.5 x 41 x 9mm. 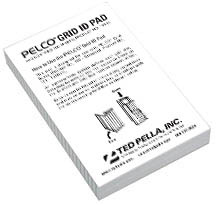 TEM grid identification cards which fold (in thirds) close the same size as the PELCO® Grid Storage Box #160 or #161. Can be stored with the gridbox in plastic bag or envelope. Fifty spaces are provided with alphanumeric listing, and two spaces next to it are used for data such as experiment number, patient or case number, etc. Pad of 100 sheets. Courtesy of Robert F. Bils. 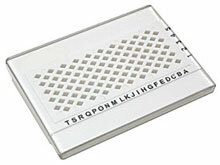 Holds up to 50 tabbed, 3.05mm TEM grids in alphanumeric labeled compartments. The box is similar to #160 Grid Storage Box except that the body is made deeper to accommodate the extra length necessary when PELCO® Tabbed TEM Grids are used. Dimensions: 77.5 x 41 x 9mm. 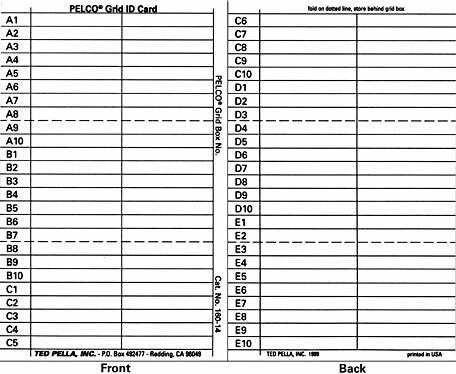 4 digits maximum for numbered PELCO® Grid Boxes. Grid Storage Boxes style 160 Standard and style 161 Tabbed may be ordered consecutively numbered. Numbers are permanently stamped into the end as shown. 100 piece minimum for numbering. Choosing Your Numbers: Use No. 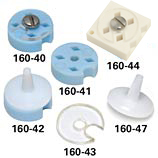 160-7 or 161-7 when ordering a 1-100 numbered set and use No. 160-9 or 161-9 for a special number sequence. 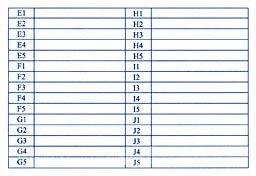 Note: special numbering sequence sets are limited to four digits and are non-returnable. Orders are non-cancellable. Intended for use in both routine grid handling and long term grid storage. Holds 100 transmission electron microscopy grids. Each of the diamond shaped compartments will accept a standard 3.05mm grid. Each position has a letter and number molded into the surface of the box. To further ease grid handling, the plastics are anti-static treated. 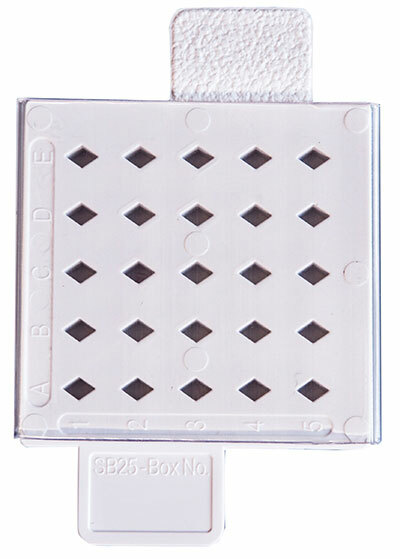 A central access position in the lid reduces the number of grids exposed when selecting any particular grid. Dimensions: 85 x 59 x 7mm. A record card is supplied free with each SB 100 grid box. The folding card has a durable coated exterior and the interior is suitable for writing with normal pen or pencil. Numbered on the front of the box, and on the end. The individual box numbers are never repeated, they are truly unique. They are also supplied in sequence. The clear cover can be rotated smoothly once the slight resistance of the park position has been overcome, exposing a maximum of 2 or 3 diamond shaped holes at a time. The material is antistatic and the cover is self-lubricating, reducing friction. 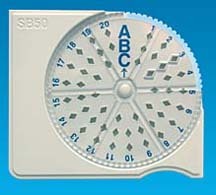 The 50 diamond shaped holes have an alphanumeric reference system and each box is supplied with an indexed record card. The boxes can be stacked. Dimensions: 75 x 65 x 7.3mm. Also available with unique, individual, identification number stamped on each box. These convenient smaller 25-grid storage boxes are for experiments that require fewer grids, for those users who prefer to have a separate grid box for each experiment or sample. Intended for both routine grid handling and long term storage, they also make a low cost alternative for multi-user facilities. The plastic material contains a special anti-static additive. The ergonomic design of the grid box with side tabs to allow it to be firmly gripped on either side while sliding the cover back on the box to reveal the grids a row of five at a time provides easy access to your grids. Additionally one side tab has a matte finish that is ideal for notation with a Fine-tip Lab Marker. The GSB50 and GSB100 TEM Grid Storage Boxes are used to store TEM grids for routine grid handling, transport and long term TEM grid storage for standard 3.05mm grids. Compartments are diamond shaped for safe grid storage. Easy position identification with number/letter combination printed on the white grid body. Both body and clear sliding lid are anti-static treated. 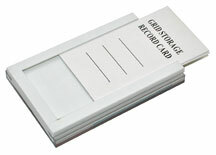 A paper grid storage record card with printed ID numbers is included with both the GSB50 and GSB100 TEM Grid Storage Box. Dimensions for both boxes 75 x 55 x 6.5mm. 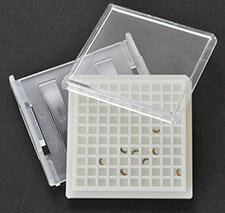 These grid storage boxes accommodate 30 grids and are designed to fit in the slots of a standard slide box, thus facilitating convenient storage and filing of your samples. Both body and clear sliding lid are anti-static treated. The MEM grid boxes incorporate a number of innovations for improved ease of use, more secure storage and integrated documentation. The additional slider with a window between cover and grid storage box exposes only 4 grids at the time and prevents grids from falling or "jumping" out of the storage box. Integrated grid storage record card inserted in a dedicated slot on the back of the MEM grid box. The storage box body is made of white plastic providing good contrast. The cover lid and the slider with window are both made from clear plastic providing clear visibility. The Cryo Grid boxes are used for storing and transferring vitrified cryo-EM specimens prepared with cryo-devices like the FEI Vitrobot, Gatan CP3, Leica EM 6P, as well as other cryo vitrification systems. There are two versions of these boxes, each with 4 storage positions. The round one is the most widely used and is available in two colors and three versions: with clear lid, pin type lid, and without lid. The round boxes can be used on the Gatan 626 and CT3500 cryo transfer systems and on the FEI Vitrobot and Gatan CP3. The square Cryo TEM grid box includes a non-static rotatable lid and fits the Gatan CT3500 Cryo-Transfer Holder and Gatan CP3. All boxes have a UNC 5/40 thread in the center. 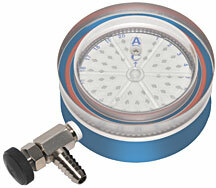 On versions with clear lids, the lid is held in place with a stainless steel screw. Now available in four different colors, the Handling Rod screws into the threaded center of #160-41 round cryo grid box for pick-up and storage applications. Can be used to store the cryo grid box in liquid nitrogen. Available in white, yellow, blue, and black. An ergonomic and efficient device to open the pin type lid (#160-47) of a cryo grid box (#160-42 and 160-42W). 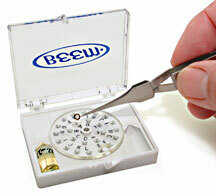 Spring-loaded pin vise grips the pin type lid firmly and securely. High quality aluminum body construction is good for working in liquid nitrogen. Ribbed barrel design makes it easy to unscrew the lid. This handy tool can also be used to carry the covered cryo grid box. 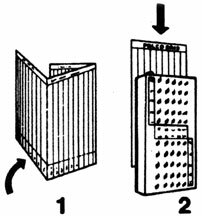 Four position grid box with lid for holding FIB lift-out grids or half grids. The grid box cavity depth is only 1.7mm, thus preventing the grids from rotating in the diamond shaped cavity. The FIB grids can be relatively easily loaded/unloaded using sharp tweezers. 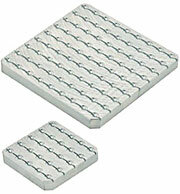 GSB-100 Storage Box for 100 FIB lift out grids or storing standard 3mm TEM grids flat. No adhesive in tray (made from ABS). Cavity size is 3.34 x 3.34 x 1.5mm (0.13" x 0.13" x 0.06"). Complete with clear polystyrene lid and clear polypropylene clip. Stackable. Same internal and external dimensions as standard GSB-100 storage box, but with anti-static tray made of black conductive polypropylene. Complete with anti-static cover and polypropylene clip. Stackable. This robust PELCO® TEM Grid Vacuum Desiccator holds up to 50 TEM grids in the grid box with a rotary lid with a slot hole to prevent the rest of the grids from falling out. Storage under vacuum eliminates contamination or dust and is ideal to preserve hygroscopic samples. The use of durable, non-outgassing, black anodized aluminum and silicon O-rings makes it suitable for pumping down to 10-3 mbar. Capable of holding vacuum for many months. Metal vacuum valve with PTFE shaft seal. Use a small vacuum pump to evacuate. Vacuum connection for pump-down is a 1/4" (6.35mm) barb fitting. Ideal for storing, transporting and shipping. Overall size w/o vacuum valve is ø76 x 35mm (3" x 1.4"). Protect your valuable TEM calibration and test samples with this sturdy, clean storage and transportation box, manufactured out of vacuum grade aluminum. 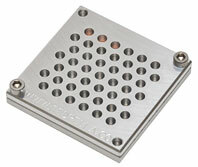 Holds one standard 3mm TEM grid. 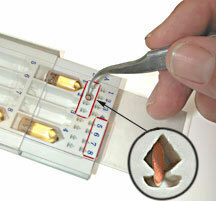 Easy access for loading and retrieving with tweezers. Lid can be secured with thumb screw. Shown in open position. Turn lid to close and secure with black knob.